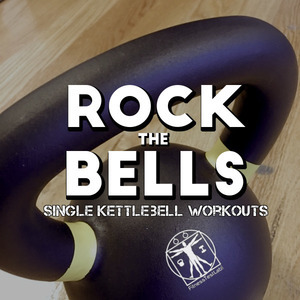 As any long term Fitness Test Lab reader knows, I train regularly with kettlebells and I like them a lot. However, for reasons I’ve covered separately I’ve decided to add barbell training to the mix to keep things interesting. My home gym has been upgraded with the addition of a set of Vulcan Strength black bumper plates, a Vulcan Strength Absolute Powerlifting bar, and a pair of squat stands. 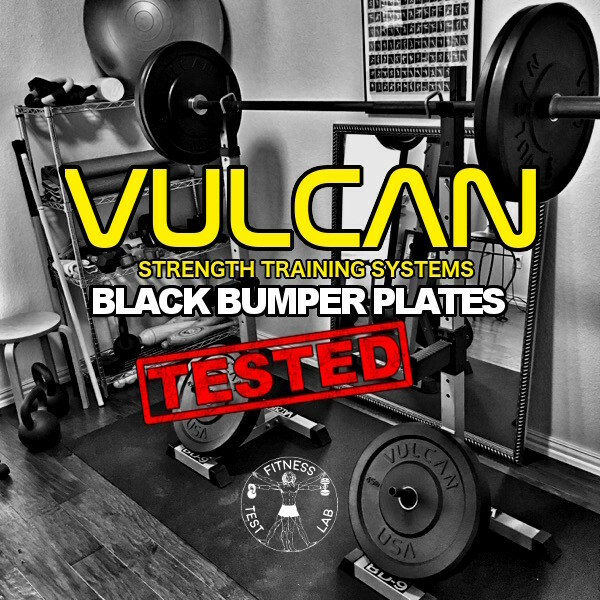 What follows is a review of the Vulcan black bumper plates. The plates arrived packaged in four boxes. The 10 and 25lb plate pairs were each packaged in a single box. The 45lb plates each came in their own box. All plates were well protected with plastic sheeting, although I wouldn’t expect them to sustain much damage even if they were mishandled. They’re rubber bumper plates after all, designed to be used and abused. One of the boxes included a flyer with helpful tips from Vulcan on how the plates were made, how to care for them, and what to expect. It’s essentially the same information available on their bumper plate product page, printed up in flyer form. I thought it was a nice touch, especially for someone new to bumper plates like myself. One of the points covered in the flyer was regarding the smell of brand new bumper plates. Vulcan black bumper plates are made of virgin rubber, which smells like…you guessed it, rubber. 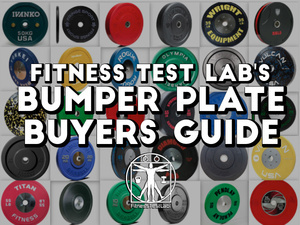 This is entirely normal and applies to any product made of rubber, not just bumper plates. The odor from these particular plates is low, but still noticeable. The flyer explains that the odor goes away with time and exposure to air. However, if you’re sensitive to the smell of rubber or intend to use the plates in a small enclosed space there are steps you can take to neutralize the odor. I’ll cover what I did to address the rubber smell in a separate section. The Vulcan black bumper plates are Olympic-sized plates. For those that don’t do Olympic lifting or CrossFit, this means the plates are 17.7 inches in diameter with an approximately 2 inch collar opening. You’ll need an Olympic-sized bar to go with them. I have a Vulcan Absolute Powerlifting bar to use with them, which I’m reviewing in a separate article. Vulcan black bumper plates are made of virgin rubber rather than recycled rubber, which results in a denser and therefore more durable plate. I’m greatly oversimplifying the process, but recycled or “crumb” rubber plates are made from very small pieces of old tires pressed into shape and held together with a chemical binding agent. The binding agent can break down over time, potentially allowing pieces of the plate to break off with use. Crumb rubber plates may cost less than virgin rubber plates, but this is definitely a situation where you get what you pay for. The collar inserts (i.e. 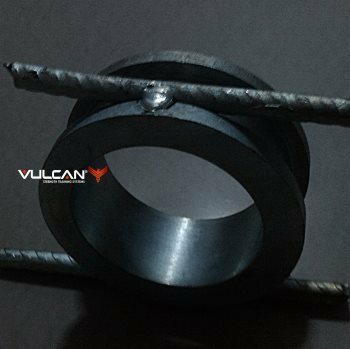 the metal ring in the middle) on all Vulcan bumper plates are anchored firmly in the rubber by barbs made from welded rebar. The rubber is molded around the barbed insert to produce a permanently fixed insert. This is a nice feature first introduced by Vulcan in 2011 that adds to the longevity of the plates because it allows them to withstand more drops. Speaking of drops, Vulcan bumper plates are tested to withstand up to 30,000 drops. That’s a lot of drops. This isn’t just marketing hype, Vulcan has a whole setup dedicated just to drop testing bumper plates. 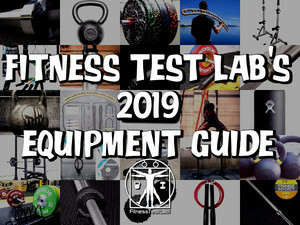 The video below provides a glimpse into how the testing is done, which emulates real world use. Vulcan black bumper plates are the first bumper plates I’ve ever owned, so I have no other bumper plates to compare them to. 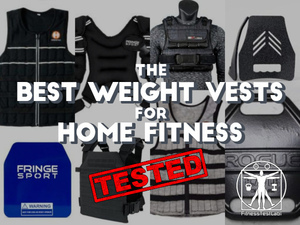 However, I’ve owned and used a lot of fitness equipment over the years and I know quality when I see it. Vulcan Strength Training Systems makes high quality equipment and these plates are no exception. 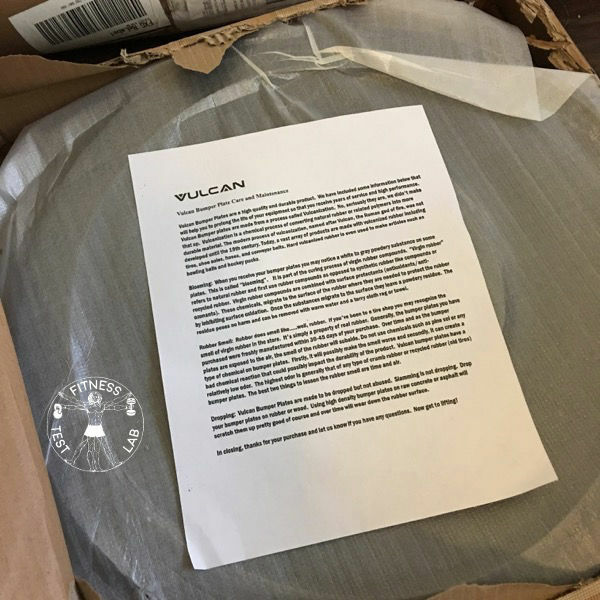 Vulcan stands behind these plates with a nice warranty too – three years on 25, 35, 45, and 55lb plates and one year on 10 and 15lb plates. I’m using my Vulcan black bumper plates with a Vulcan Absolute Powerlifting bar and a pair of Valor Fitness BD-9 squat stands I found on Craigslist. 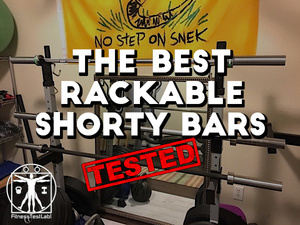 I don’t intend to review the squat stands separately, so I’ll just say they work very well for the limited space available in the spare bedroom I call my home gym. I also bought a pair of Lock-Jaw barbell collars off Amazon that work perfectly for my purposes. I’ve been using the bumper plates for the last couple of months to supplement my kettlebell workouts with squats, deadlifts, and standing overhead presses. The Vulcan equipment has been an excellent addition to my home gym. 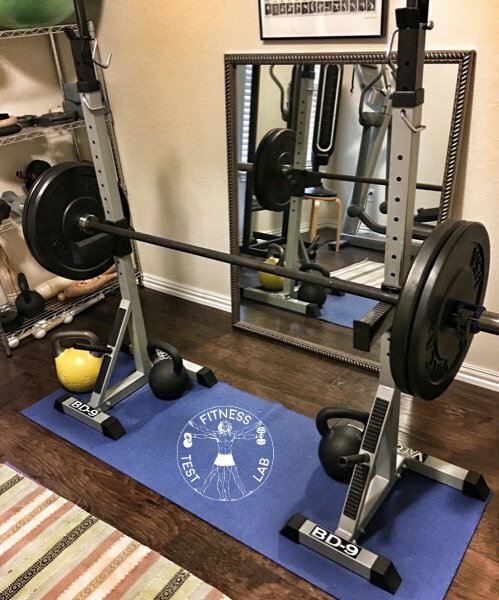 I’d recommend it to anyone looking to outfit their own gym with quality bumper plates without breaking the bank. 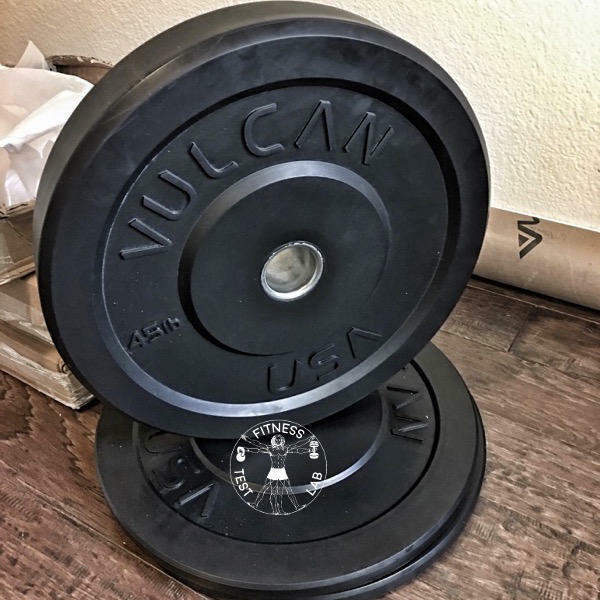 Vulcan black bumper plates are made of virgin rubber, and while they are low odor they aren’t entirely odor free. For those sensitive to the smell of rubber, I offer the following tips for eliminating the rubber smell from brand new bumper plates. First, expose the plates to sunlight for a few hours. The UV rays from the sun will help speed up the off-gassing process. Be sure to expose both sides of each plate to the sun. Keep them out there long enough for them to get warm, but not long enough for them to get too hot to touch. Too much UV exposure can start to break down the rubber and harden it, which you definitely don’t want. 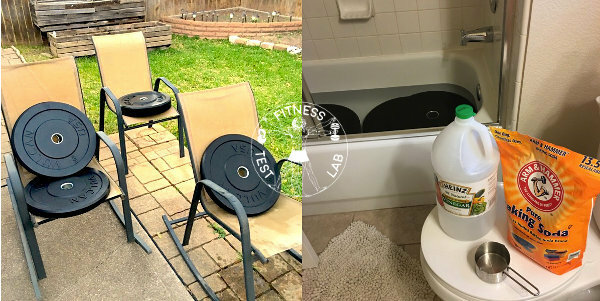 Second, soak your bumper plates in a solution of water, white vinegar, and baking soda. I filled my bathtub with just enough water to cover my plates and added two cups of vinegar + two cups of baking soda. I mixed the vinegar and baking soda in the water till all the powder was dissolved before placing the bumper plates in the water. Make sure the plates are completely submerged. Leave them soaking for at least an hour, then drain the tub and rinse the plates off with clean water. In my case I did two soakings – one for the two 45lb plates and another for the rest of the plates. After I was done the rubber smell of my new bumper plates was completely gone. If the smell of your bumper plates persists after taking these two steps, repeat the process till you’re satisfied. 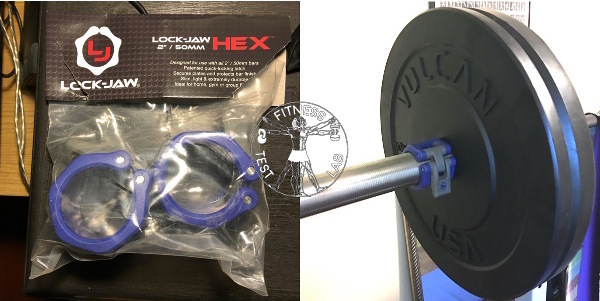 Ordinarily I do a pro and con on every product I cover but I can’t really find anything to critique about Vulcan black bumper plates. They’re affordable, well made, and have an excellent warranty. I’ve been very happy with the Vulcan equipment I own. 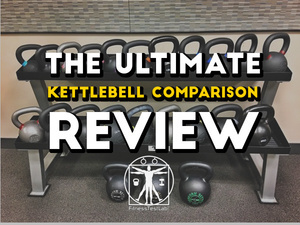 This includes both an Absolute Training kettlebell (which I reviewed here) and an Absolute Competition kettlebell in addition to the bumper plates and powerlifting bar. 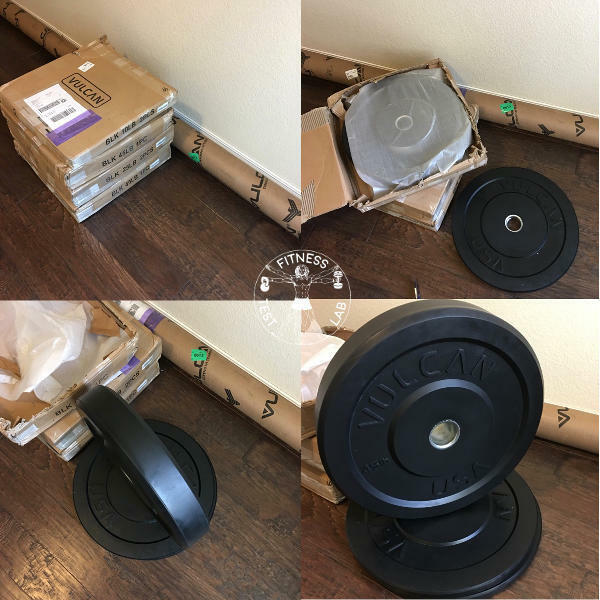 If you’re looking for a basic set of bumper plates for your home gym, definitely consider the Vulcan black bumper plates. Just for kicks, here’s a clip of me putting my Vulcan gear to use to counteract the effects of prolonged sitting, the bane of the office worker.